On a typically balmy evening (Sunday, 17th December 2006, to be precise...), Floridian death metal outfit Deicide performed at the now long gone The Arena venue in Fortitude Valley, Brisbane. A performance from Deicide is a special even in itself, however it became something of a boon for fans of shred guitar as Ralph Santolla, the one-time guitarist for a slew of bands including Death and Iced Earth, stood stage right of Deicide’s polarising bassist and vocalist, Glenn Benton, and delivered a masterclass. The crowd were unruly that evening, just as they had been for Cannibal Corpse in October of that same year. Benton was spat on by a punter and the vulgar behaviour continued to point that Benton started skipping songs in the set. Moronic punters and a shortened set list be damned, this was a fine performance from the band, especially Santolla. A key quality to observe when watching a musician that is exceptional at their craft, notice they perform with an air of nonchalance… as if they have all the time in the world. Tonight, Santolla’s beautifully melodic soloing was underpinned by former Cannibal Corpse guitarist Jack Owen and the brutal rhythmic onslaught of drummer/ percussionist Steve Asheim. Both are excellent musicians, so it was even more noteworthy for Santolla to steal the show. I won’t forget Santolla’s performance that evening, as I am sure so many fans of heavy metal won’t forget the outstanding guitarist since it has been sadly announced he passed away on Wednesday, 6th June, 2018. Santolla spoke his truth, he was mindful to appropriately represent his thoughts and feelings on so many of the people he performed alongside and the career episodes. I had given him a commitment that I would send him an unedited transcription of our chat; a far-reaching conversation that went for over an hour. I still have the transcription and audio of our chat from that day, it’s a great read and it’s always a joy to hear Santolla talk. However, reading an email exchange between us from the time, Santolla wanted to have a chat to go over some ‘small’ things he must have picked up in the transcription. As he was about to travel to Connecticut to work with famed producer Max Norman (Ozzy Osbourne, Megadeth), he was too busy to lock in a time to discuss. Lucky for me, I got to chat to one of my all-time favourite guitarists about his career (when it’s all said and done) for well over two hours! In the back of my mind, I like to think that the god-force that holds everything together knows how special I feel Santolla’s guitar playing is, and that I had enough merit points in the karma bank to warrant another conversation with him. Either way, it a was unique experience I must say. Santolla is witty... hilarious even, as he answered my prepared list of questions for a second time. Will I publish the audio or the transcription of the first conversation? No. Santolla clearly felt that there were comments he prefer be kept out of the public domain and I will always respect that. It must be said that nothing in the content of Santolla’s commentary from our first conversation is in anyway controversial or slanderous as far as I'm concerned. I’m sure he knew the content that he didn’t want broadcast, but I'll never know what he wasn’t satisfied with as we didn't talk about it. Changing topic, having had time to reflect on Santolla’s impact on modern heavy metal now that he’s no longer with us, it isn’t easy to articulate just how different he is when compared to just about every other extreme metal guitarist out there. Some guitarists excel at shaping chords so each riff sounds like the precise gear change of a Formula One race-car. Others have perfected the art of crisp and clean picking strokes so that each note resonates. Many fans are drawn to heavy metal due to the myriad of fret bending guitar solo’s. 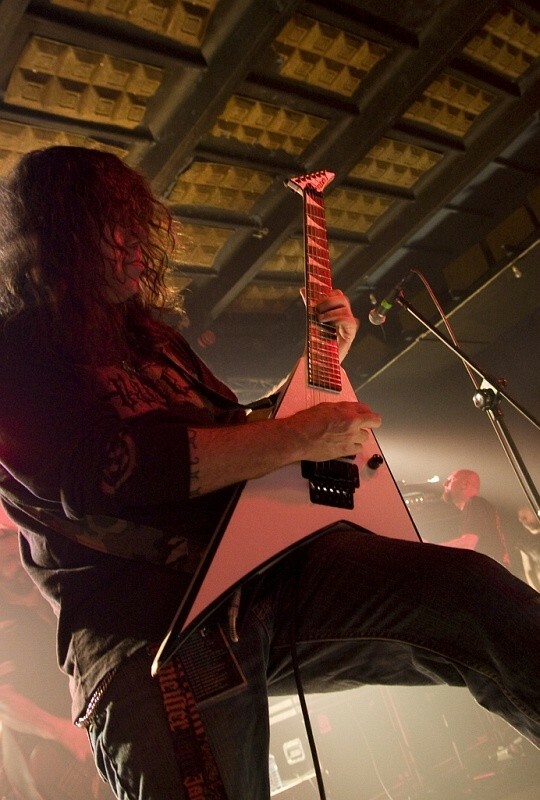 Santolla was an equal measure of the first two descriptors with a double serve of the third… his guitar solos on The Stench of Redemption (Deicide-’06) captivate and enthral. Santolla should be credited with breathing new life into Deicide after the messy split with foundation guitarists and death/ thrash masters, Eric and Brian Hoffman. But that isn't the reason his tenure in Deicide is most noteworthy. Through Santolla's solos across The Stench of Redemption, one can hear slithers of Queen's brilliant guitarist, Brian May; echo's of the Flamenco master, Paco De Lucia; the influence of the great and often overlooked one time Scorpions guitarist Michael Schenker and long time replacemet, Uli John Roth; and Jazz fusion virtuoso and proto-shred icon, Allan Holdsworth. By my own estimation Santolla somewhat broke the mould of death and extreme metal soloing to the extent that it was re-cast through his performance across The Stench of Redemption. I have made a concerted effort to purchase each Deicide and Obituary album on vinyl (he joined Obituary after he left Deicide) that Santolla is credited as a performer. I’m almost there and am yet to commit to looking for the vinyl edition of his lone Iced Earth appearance (power metal just isn't my thing...). I would dearly love a mastered copy of a live performance of Santolla in Deicide from 2006/7. If an eagle-eyed reader has a copy hit me up! There are plenty of eulogies and thoughts from fans of Santolla’s out there on social media. He made an impact on people’s lives and created a lasting memory. I’m sure wherever he might be right now… he is chuckling over the confusion in the public domain over the day of his death (a family member posted a well-meaning and sentimental statement on Facebook when Santolla was still in a coma alluding to his passing). Music is of course, very subjective. So, it could be argued it is the same with talent. But it shouldn't be in anyone’s interest to suggest that Ralph Santolla is anything but one of heavy metal’s revered and posthumously sanctified guitarists and shredders.